According to the often-sited statistic, our food travels on average 1,500 miles before it reaches our plates. Agribusiness is SC’s largest industry however over 90% of our food is still imported. By digitally signing up below, YOU PLEDGE to help Lowcountry Local First strengthen our local food system. YOU PLEDGE to support your local farmers, fishermen, ranchers and purveyors. Choosing to eat locally-grown and produced food positively affects our environment, our health, our communities, and our local economy. Eating local is for everyone, and the ways you can do so are endless. We look forward to helping you make a shift in your habits and spending. With innovative arrangements that link producers and consumers such as community supported agriculture (CSAs), abundant farmers markets, local sections in your grocery store, and farm-to-table relationships, local food is abundant in the Lowcountry! WHAT: A month-long challenge to eat locally-produced food. We are asking participants to pledge to shift $10 or more of their weekly food spending towards our local food system. HOW: Register and make your pledge. We’ll send you weekly resources, recipes and tips on how to shift not just throughout April but make lasting changes to your spending and eating habits that can continue year-round. Access our resources on-the-go by using our free mobile app. Search “Lowcountry Local First” in your mobile app store to download. COST: There is no cost associated with the challenge, just a commitment to shift $10+ per week towards local food sources. Prizes will be awarded throughout the Challenge to those who interact with the weekly #HowIEatLocal Instagram contest. SO, WHAT IS LOCAL? For the purposes of this challenge we are challenging you to eat food sourced as close to home as possible, and always within the state of South Carolina. CHALLENGE OTHERS! Use the toolkit (will be provided) with content and images to help encourage others to join you in the Challenge! – Access to the Eat Local Challenge section of our app where you will find details, tips, CSA information and the ability to track your local spending. – Weekly emails stuffed full of tips, recipes and suggestions for the Challenge. — Invitation to participate in the #HowIEatLocal weekly Instagram contest, with weekly prizes! – Full access to the Eat Local Challenge Facebook group, which will include recipes, tips & tricks, information regarding discounts and local food options at participating businesses. – Information regarding all Eat Local events and happenings. We want to hear from you throughout the Challenge! Learn about other challengers’ experiences and share your own online. 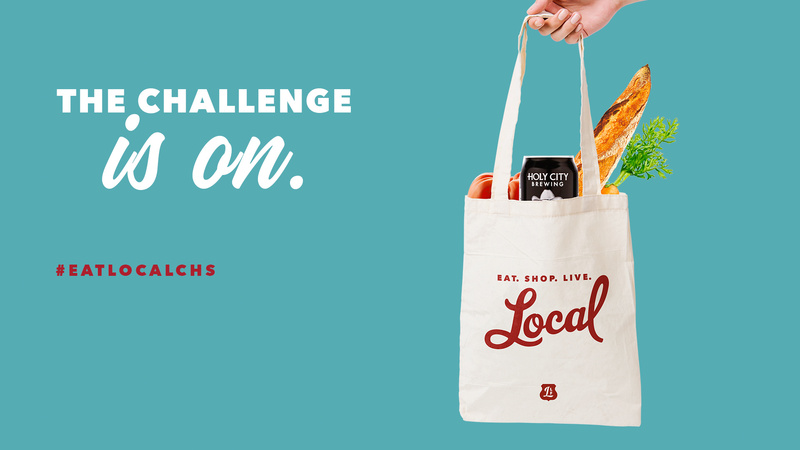 Tag us in your social media posts, use the #EatLocalCHS and join the Eat Local Challenge Facebook Group. Thanks to netGalaxy Studios for their help in making our free mobile app come to life! Download it today by searching “Lowcountry Local First” in your smart phone’s app store – and head to the “Eat Local” section for resources on the go.